Affco Gro Aid is a high quality brand and has a range of product and is sold in many parts of the world since 1976. Affco Gro Aid is a high high quality hair supplement on the market that Conditions , Thickens & Darkens in one application. It is free from LEAD, AMMONIA and PPD which often damage hair and can cause allergic reactions to sensitive hair and skin. AffcoGro Aid help to Darken and restores your dark hair colour without the use of a hair dye. Affco Gro Aid uses only the highest grade of ingredients available and meets all "EU" Cosmetics Regulations and follows GMP method of manufacturing which is required and approved by FDA. 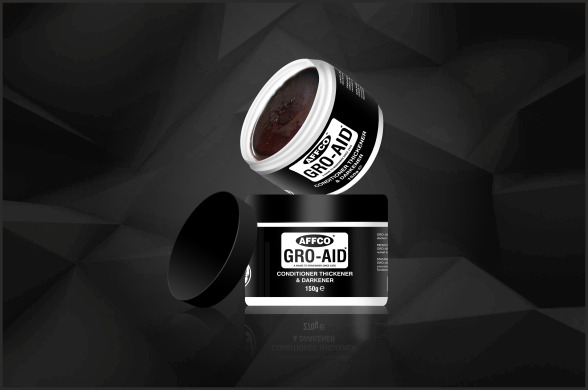 Affco Gro Aid is a high quality hair supplement which Conditions, thickens & darkens in one application. It is free from LEAD, AMMONIA and PPD which often damage hair and can cause allergic reactions to sensitive hair and skin. Affco Gro Aid is rich in vitamins, protein & other nutrients that enhances your hair. 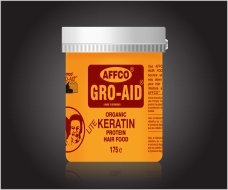 Affco Gro Aid Keratin Hair Food provides complete nourishment to scalp and hair. It is light none greasy, non sticky. It melts in you fingers turning into an oil sheen, providing a healthy sheen and moisture. It's the lightest hair dress on the market available, enriched with vitamins and proteins. Enriched with Carrot Oil, Olive Oil, Tea Tree Oil, and other essential ingredients to provide high sheen and moisture. It's deep fertilizing and oil moisturizing formula enriched with protein provides soft, silky, shiny and healthy look. Eliminates dryness and dandruff. 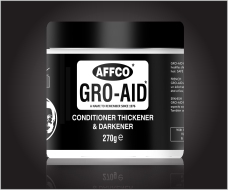 Affco Gro Aid Conditions, Thickens and Darkens and is enriched with ingredients which helps hair growth and provides healthy shine and perfecting grooming. Please note Affco Gro Aid Conditioner , Thickener & Darkener is only suitable for dark hair.